Caramel Biscuits is the name of a recipe that I found in a hundred-year-old magazine, but the recipe name may be a misnomer. This is a dessert or snack pastry, not the typical biscuit. Caramel Biscuits are similar to cinnamon rolls, but contain no cinnamon. Instead nutmeg provides a more nuanced and sophisticated flavor when combined with the rich brown sugar filling that is embedded between each layer of bread. They are made using baking powder, rather than yeast, so are quick and easy to make. Preheat oven to 400° F. Put the brown sugar and butter in a bowl; stir to combine. Set aside. Place flour, baking powder, and salt in a mixing bowl, then stir together. Cut in the butter and lard, then add water and milk. Mix using a fork until dough starts to cling together. If needed, add additional water. Divide into two balls. Put one ball put on a floured pastry board. Roll into a 1/4 inch-thick rectangle approximately 6 inches X 10 inches. Spread one-half of the brown sugar mixture on the rectangle of dough. Rolling from the wide side, roll up the dough, and then cut into 3/4″ slices. Place slices in a greased 10″ inch round (or similar-sized) pan. There should be about 1/4″ space between each slice. Repeat with the second ball of dough, again putting the slices in the pan. Sprinkle each slice with nutmeg. Place in oven and bake for approximately 25-30 minutes or until lightly browned. Remove from oven. Let cool for 5 minutes, then remove from pan. Serve either warm or cold. Posted on April 15, 2018 April 14, 2018 by SherylPosted in FoodTagged biscuits, recipe. Wow, that’s a whopping amount of calories, but it must be for the whole recipe. It’s got to be for the entire recipe. There’s no way a single biscuit could have 2,360 calories. Wow this is decadent treats. A tasty treat! My daughter used to enjoy making these but called them pinwheel scones. I wish I had some for my breakfast. I’m not currently not very far ahead on posts, and just made these yesterday. I had a left-over one for a mid-morning snack today, and it was still delicious. When I got to the 1-1/2″ in the description, I was puzzled, but then I read again that they’re made to be “dessert or snack pastry.” Even so… I’ll have a half-dozen, thank you! They look delicious, and quite a nice variation on a standard biscuit. Old recipes are always open to so much interpretation. I’m not sure how large they “should” be. Since the recipe directions indicated that each slice should only be 3/4 inch thick, I guessed that the biscuits shouldn’t be very big in diameter. But, it would be easy to make them larger, just roll the dough from the narrow side (instead of the wide side). Now we’re talking! These look fabulous! 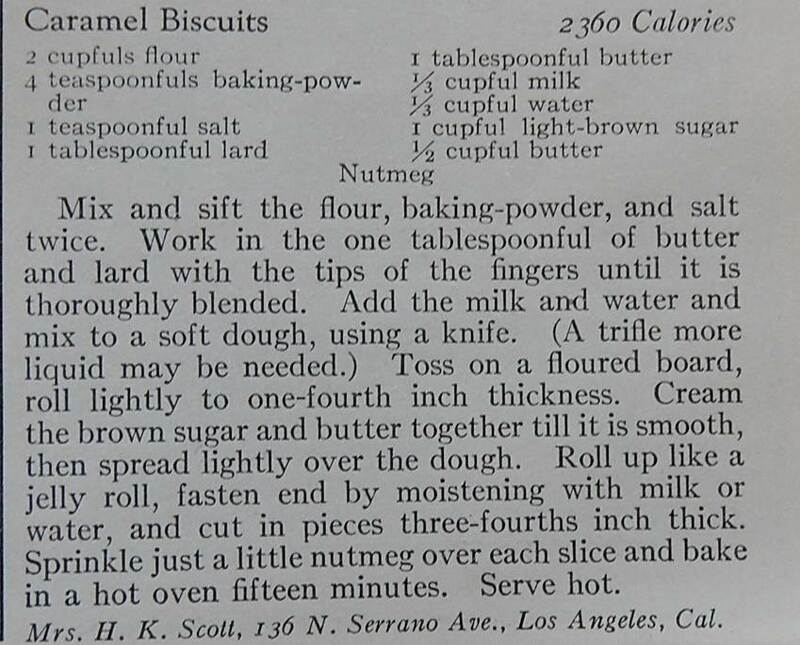 I found the recipe in the July, 1917 issue of Good Housekeeping magazine, so it’s American – but I bet you’re right that the term “biscuit” was being used in a more expansive way like the British do. I love the slight differences that in local talk that make every area around the world so interesting. I can’t wait to make these…was going to yesterday and became busy playing games with the grandsons instead. I like your priorities. Spending time with grandchildren is so special. Yes, it is…one of my best joys in life. Oh my! Now you’ve set my tummy to longing. Yum! Whoa! Look at that calorie count. These look a little too delicious. The calorie count has got to be for the entire recipe. I think that calorie counts were a relatively new thing a hundred years ago, and that they had not yet come up with the idea of presenting the information by serving. 1917 was the first year that I saw calorie counts in the old magazines that I browse through when looking for ideas for this blog. I thought that too. Must be the whole delicious recipe. I think too ,the calories are for the whole recipe ,for if you divide the calories by your servings it is roughly 80 calories per biscuit, that sounds about right to me. These do look good. Looks yummy! You find the most delightful things! Thank you! It’s wonderful to hear that you enjoy the recipes that I feature in this blog. I had a neighbor who went to bed early in the evening to read cookbooks. I’m not that bad, but I like reading about food. It’s fun to read about food. There are so many interesting recipes out there. These look wonderful! I will definitely keep this recipe in mind. My family loves cinnamon rolls, but they do take a long time to make. I would like to try this recipe because it looks quicker and yet still delicious! I was really pleased with how this “quick bread” recipe turned out. If I hadn’t known that the recipe called for baking powder instead of yeast, I think that I might have had difficulty telling whether it was a quick bread or a yeast bread. 360 for two sounds much more reasonable than 2,000+ calories. They look and sound divine! I love nutmeg. I always use it in French Toast and other dishes that would typically use cinnamon. I think that nutmeg is an under-utilized spice. It has a very nice flavor. Now these I have to try! Do you think freshly ground nutmeg would work? We brought some back from Barbados and I have been looking for ways to use it. mmm. . . my mouth is watering. Fresh-ground nutmeg would be wonderful. Nice recipe. I’ll try this one. Maybe when grandkids come this summer. These would be perfect to make when grandkids are visiting. Yum! 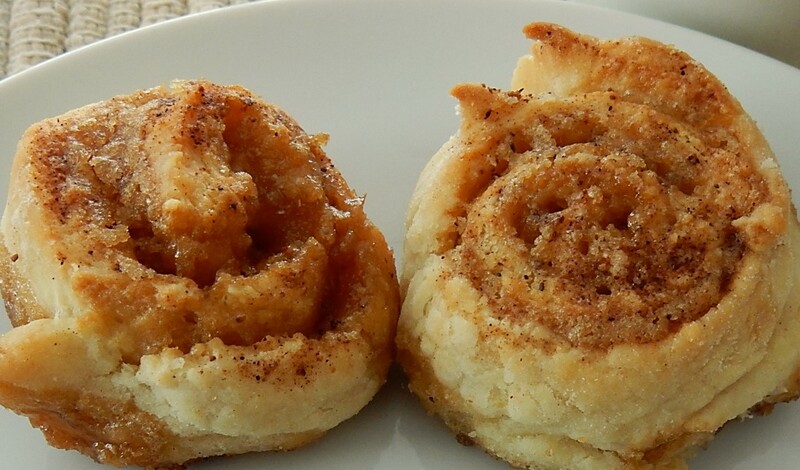 and definitely looks like a cinnamon roll … It’s time to get back in the kitchen! I like that they are both easy to make and tasty. They must be delicious. Thank you for sharing the recipe. I was all in, until I saw the calorie count! I see you believe it’s for the whole batch. My kids used to take leftover dough and put cinnamon and brown sugar in them and call them crusties. Nothing as nice as these. I love nutmeg … I have the cutest little nutmeg grater! I don’t see a Pinterest pin here or I would add this to my recipes on Pinterest.